I made this photo because me being bisexual, and seeing that we had to make a poster on something from the road poster. So I choose diversity embraced, to represent embracing sexuality. So I choose a picture of two people embracing each other (pun not intended) and the LGBTQ flag to represent what Im talking about, so the message would be clear. During the time I was making this I was in the mood for drinking a hot chocolate while the snow falls, so I based my image off of that. In my first trial for this poster I decided to use a darker filter for the photo and to leave the icon as a white color, but I wanted the photo and icon to stand out and so I changed the filter and added a circle behind the icon to help it stand out more. 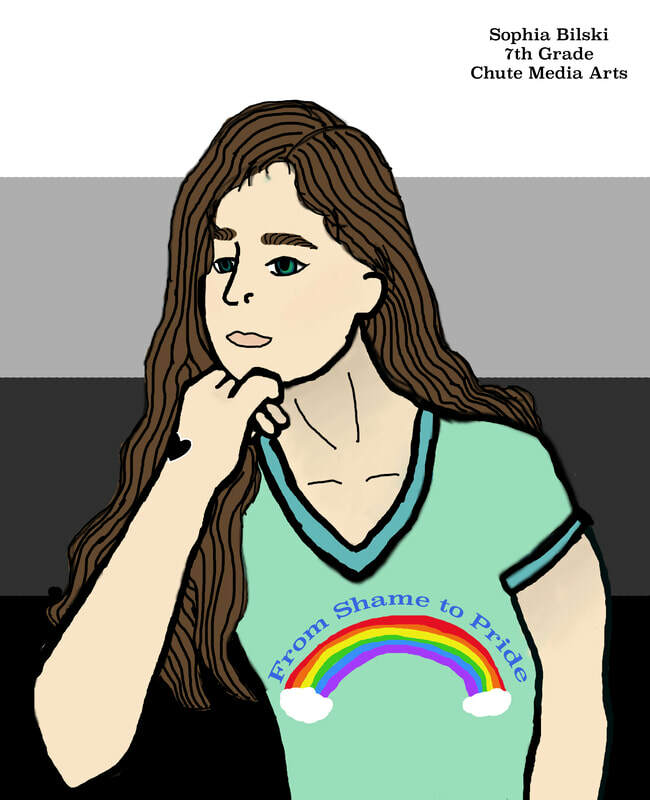 Since we are doing issue based poster, and I decided to do one on Lgbtq community and how it has changed over the years. What I mean by that is how people used to fell shame for it, but now they feel pride. On the second day I focussed more on the outline than the colors because it looked messy and sloppy. I continued to work on the outline (which I finished), then moved on to adding color to the picture. I finished adding color to some parts of the photo. I changed the skin tone, got the hair color, and I started to add color to the hair. I'm going to make a goal for this week, I want to be able to finish adding color, and shading the drawing. ​ I am almost complete with my project. I have finished the drawing part but now I want to edit somethings. I would like to crop it and make my image look bigger. The meaning of my poster is about the change of times, how people used to shameful towards the sexuality then as time change people felt proud to be in the lgbtq community. I choose to do the background as a fade of color because, people used to feel shame towards there sexuality which is black, but when people started to feel better about their sexuality it becomes lighter. I choose to do an outline of myself because I am part of the lgbtq community so the meaning of the poster increase because it affects me. All in all, I feel great about how this looks. It took we weeks to make and this was so worth that time. I took some inspiration from the inspirational posters that the sixth graders had made. 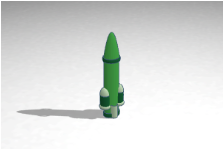 1:Today I started working on my rocket ship, I think it is going well. 2:I kept editing and changed up some of the designs so lights could go through! 3: I finished my project today, and changed some of the design. I added another support behind the rocket ship so it could stand and changed the roof part. 4: today I hopefully will start 3D printing, everything is ready I just need to do somethings. 5: it was printed 1st try, and looks good, I have to remove the supports though. 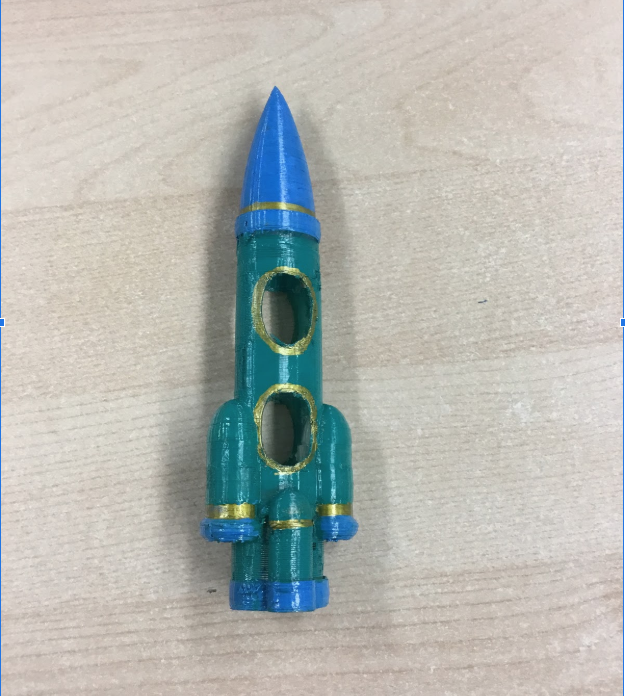 *6: I have been working on my rocket ship design for the last week or so, It turned out well, even though I have to remove the supports it will end up looking good. 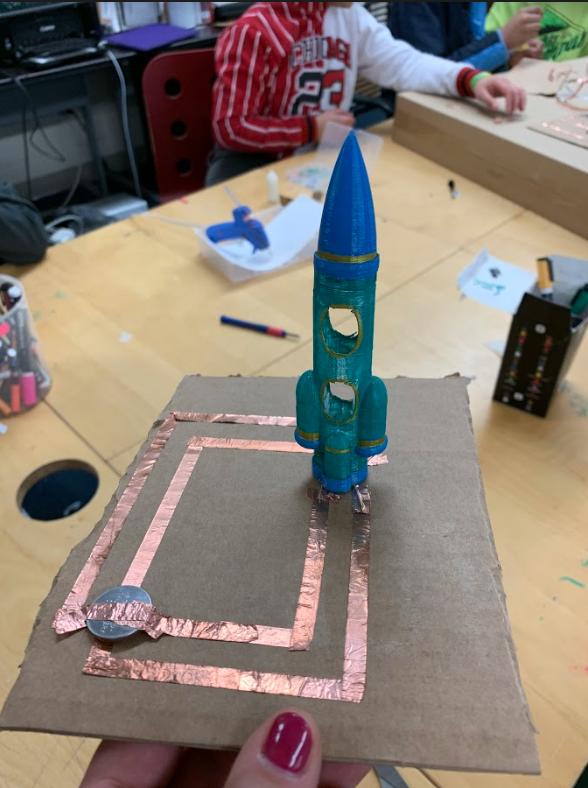 I also have been helping design the rocket ship for the show, and have been drawing it out on foam, cutting it with a handsaw, and we are just about to paint it. 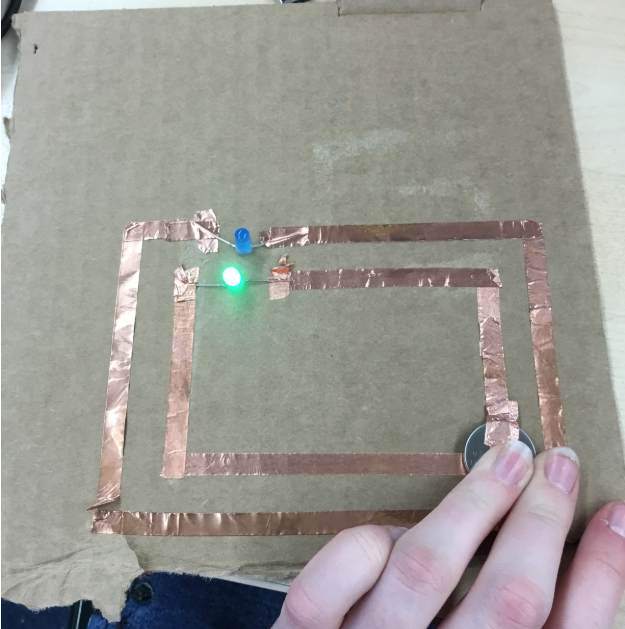 7: made a circuit today, consisted of two leds, two copper tape paths and a battery. 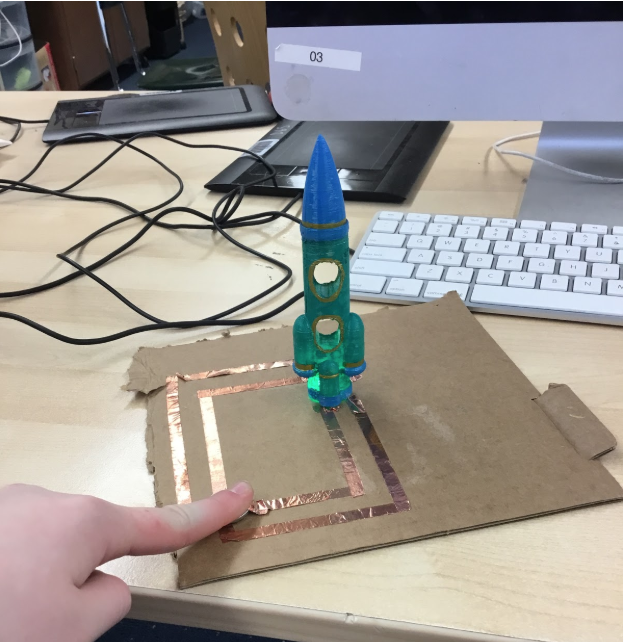 I also glued my painted rocket ship to the cardboard. 8: I cut the cardboard so that I didn't have any extra cardboard, now I need to draw on the new layer of cardboard. 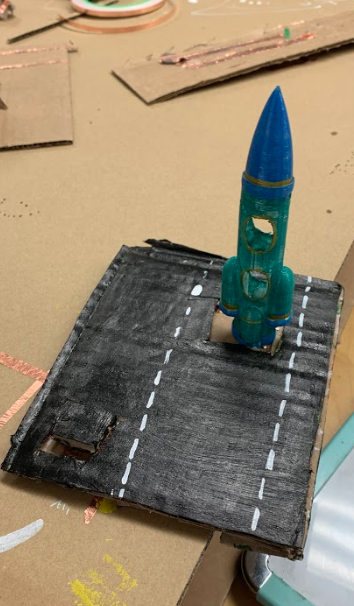 *9: Drawing a landscape on the cardboard today, I might do something like the moons surface or a run way, I might also make that thing that holds the rocket up if I do the runway. 11: I AM making a new landscape, Im making the rocket in a patch of grass and I'm probably making a launch thing-a-ma-giger (obviously has no clue what its called). 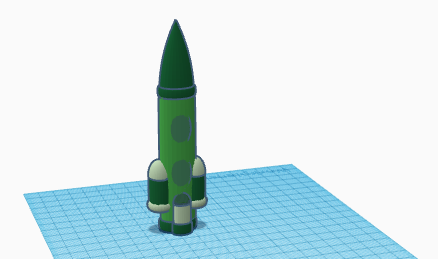 12: I finished my rocket, I have lights, every things colored, so thats its. This was very fun to do I hope I can do something similar again. I have recently been working on two songs which we made in chrome music lab. The first I made was very lively and childish and fun, the second one was like a slow walk and mellow, the third was just a but faster but I was very lively, and the forth one was the fastest of them all and felt as if you were in a dungeon level in a game. ​3. If I could change anything, it would be how much time we spent on projects. I felt like it was to much time (but it could have been I finished quick).